Buying Hearing Aids Online, What Do You Need To Know? So first off this post is dual authored, because you deserve the point of view of a Dispenser of hearing aids and a user of hearing aids. First it is me Geoff up, when Steve pipes in we will make it clear. In case you don't know I have over ten years of experience in the hearing aid profession as a provider and then as an employee of a major hearing aid brand. In the recent past we have written two articles about buying hearing aids online. While one was about hearing aids being sold on e-bay and the second about a new website called Wholesale Hearing in the UK. They were in fact both about the same organisation. Apparently they used e-bay as a test bed for their market research. The launch of the new site has caused a bit of furore in the hearing aid profession. However, this article is not about that furore, we want to talk about buying hearing aids online. We pride ourselves on giving good, honest Independent and non biased hearing aid advice on Hearing Aid Know. We re-positioned the site last year to do just that because we felt that there was a need for good non technical explanations of hearing aids and their technologies. That's why I wrote the hearing aid buying guide. Not just that, we also felt that people needed to be able to understand the difference between Providers of hearing healthcare so they could make educated decisions about their care. We support Independent Hearing Healthcare Providers here and you will never see one mentioned on the pages of this website that we are not happy to send our Mammies to. That doesn't mean that we don't trust or recommend National Providers or Manufacturer owned Providers. We just figure they are big enough to look after themselves. Funnily enough, we also support your right to buying online if you want to. We don't think online sales of hearing aids are a bad thing when there is an infrastructure set up to cater for it. By that we mean that the online sales are supported by a testing and fitting infrastructure either online or offline. For instance, Blamey and Saunders in Australia deliver a system we would support as does iHear and Eargo in the US. These companies have purposely set themselves up and designed their technology to be delivered online. The support is clearly there. The sales of hearing devices online is not new, as we said there are businesses around the world that sell hearing aids online direct to consumers. In fact, some of those businesses do an excellent job of it, in the main because they have that infrastructure in place to ensure the buyer's success. That infrastructure involves remote testing of the buyer's hearing and remote fitting and fine tuning of the devices. However, what is happening right now is the sale of hearing aids from the big brands that are not really designed to be sold in that manner. The underlying technology to do this well with the main hearing aid manufacturers just really isn't there right this minute. That doesn't mean it won't be in the future but right now to look after someone remotely is difficult at best. You need to be aware of that when you are making a decision. I am not saying it is impossible, however, it is difficult. The thing that drives most consumers is tempting prices and we understand that. Who doesn't like to save a few quid? I know we do. But there are things you need to consider when you are making a purchase decision. Because knowing all the information, allows you to make an educated decision. Before I tell you what I think you need to consider when buying hearing aids online, I want to give you some background. I still practice once a week selling hearing aids in Stillorgan, Dublin as a Locum for Connect Hearing. So I still get to see Patients. I would like to explain to you how both I and the people at Connect do things and more importantly why. So what is the usual process of selling a hearing aid for me, of course the initial step is the hearing test. After I ascertain all that I need to ascertain, I make a recommendation. Generally for me, people go away, have a think and then come back and order (it has kind of always worked like that for me). The process from there is to get the order in to the manufacturer and normally within two weeks I will fit the hearing aids. Fitting a hearing aid is not just about banging them in and turning them on. Initially, you probably would not like if I gave you the amplification you actually need. Because it would be too much for you. So I go through a fitting procedure, verifying your thresholds with in-situ audiometry (beeps and tones through the hearing aids) then setting the hearing aids to a low acclimatisation setting. This ensures that you can cope with the sound of the aids. The rest of the session is about showing you the hearing aids, the functions, how to change batteries and how to put them in. That's it for me at this time, I will tell you to read the manual but not to get freaked out. I won't talk about clean and care or show you what the tools are, why would I? You have enough to be getting on with just wearing them everyday at this stage. After two weeks, I will get you in for a follow up appointment, I will re-assess how you are doing at that stage and if everything is good, I will move your amplification up a notch in the acclimatisation. Again, I will not usually speak about clean and care at this stage, this follow up is really about starting to understand how you are getting on and your experiences. This normally happens two weeks later, again I will want to understand how you are getting on and how you are rehabilitating to amplification. At this visit, I will move you up to full amplification and I will verify the hearing aids output to ensure it is delivering what it should. We will talk about cleaning and care of the hearing aid and I will ask the Patient to begin to take detailed notes about how they are getting on. At the end of this appointment I will either make another appointment for three weeks away or if I am happy I will make an appointment for three months with the instruction to call us any time. The divergence here is usually down to how happy I am with the progress of the Patient. This is where we actually start to get real work done on really helping you to hear better. You have a lot of experience at this stage of all of the different sound environments that make up your life. You will also have pretty good notes about wht happened and where. I will take all of that information and make changes to the fine tuning of your hearing aids to ensure that they reflect your own personal preference and sense of sound. After that appointment I will call you back every six months to ensure you are doing okay, service your hearing aids and make any changes that are needed. At least once a year I will scan test your hearing to ascertain any changes. If there is a major change I will schedule a full test to ascertain the changes and re-fit your hearing aid. This goes on and on until your hearing aid can no longer be repaired. Basically for years. All of this service is included in the price that you pay for the hearing aids and we factor it into our prices. Simply because I feel this is the best way for my customers to get on well with their hearing aids for years. I believe that this is the level of aftercare and service that is needed. Not every hearing healthcare professional may agree with me and their way may well be as valid and successful as the way I do things. But there it is, I get high success rates with this approach and that is why I do what I do. Now, if you bear with us for a few minutes more, I would like to turn you over to Steve so he can explain his experiences. I've been wearing hearing aids for about 30 years now and I've gone through about 8 or 9 pairs in that time. I've been to quite a few different practices for fittings and help and have had mostly positive experiences. I started wearing hearing aids way before online sales were a thing (well, actually, I was wearing them before the Web was really a thing!) - my hearing loss has steadily got worse over the years and is now so bad that I'm out of the fitting range for most devices that are sold online. I've worn quite a few different brands too: Starkey, Siemens, Oticon and Phonak. So I've always had the pretty standard normal experience: go and see a hearing aid provider, have a hearing test, choose a set of aids and get them programmed to my hearing loss. Every time I have been fitted with a new pair of hearing aids I have always gone back to the practice multiple times for re-programming - in other words, I've not been happy with how my hearing aids sounded when they'd been programmed to the results of the hearing test. That's not a negative comment about the person fitting them, but rather the hearing test results were always a good starting point for me, which we then used to fine-tune the hearing aids so I could get the best possible hearing experience. We all have a a personal idea of how things sound, or how they should sound - I often wonder just how different what I hear today is from what someone with normal hearing hears. To me, what I am hearing when someone speaks is normal, it is how the world sounds but I am sure it is quite different to how others hear the same voice. But this is how I wanted to have my hearing aids programmed and it tooks me several visits to the audiologist to get them like this - it took changes to the hearing aid settings to get the world to sound like it should to me. There's been times where I've been in a practice having my aids re-configured and whilst trying out different settings and testing them there is a really noticeable difference in how people sound - someone's voice can go from quite high-pitched and tinny to a low growl at a flick of a switch. It has always been important to me to find the right person to fit my aids. I've changed practice once or twice because I wasn't happy with the service. I'd go in to see them as I wasn't hearing very well and I'd leave still not hearing that great - it was easy to think that the hearing aids weren't doing their job properly but once I'd gone to a different audiologist and had them adjust the aids settings in a different way I could hear really well again. I strongly believe find the right person to fit your aids is more important than buying the right hearing aid - there is a lot of great hearing aid technology out there, which work wonders but if you have them fitted by someone who doesn't take the time to set them up just right for you then you aren't getting the full value from them. Steve's views and mine coincide, in order that you get the best of your hearing aids, you need the care and attention of someone who is committed to helping you hear better. While I could fit and fine tune your hearing aids remotely with a bit of hassle, I could not verify the fitting or output. The tech to do so just isn't available right now. Verification of fit is really important in the process. so, let's finish this and give you our official line. 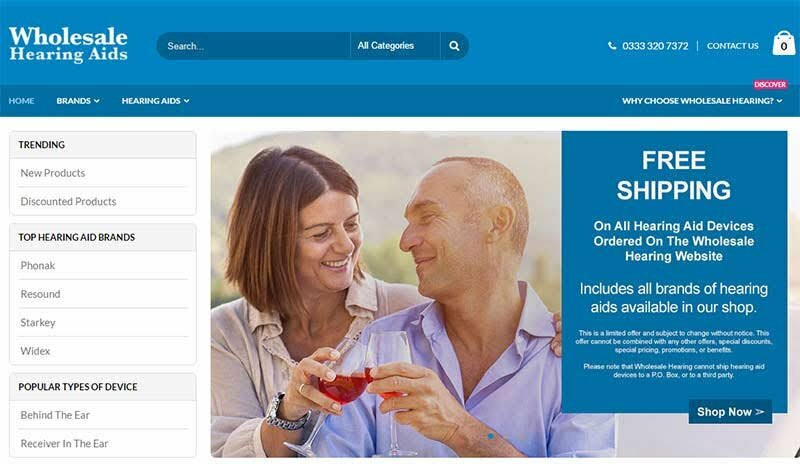 So here it is, this is what you need to consider when buying online, the first and most important thing is that hearing aids are not like glasses. You don't just put them on and everything is wonderful. It simply doesn't work like that unfortunately. You will need care and attention to get the very best out of your hearing aids for as long as you have them. That may well be up to eight to ten years. If you feel confident that the online retailer can give you that care and service and is committed to doing so, then you are onto a winner. It is both my experience and the experience of Steve that to get on well with hearing aids people generally need the involvement of a good hearing healthcare professional. We have said it here before, our worry about buying hearing aids online was that people may buy the hearing devices and then find it difficult to get a professional to help them. This is a worry in particular from any site selling hearing devices from the major hearing aid brands. Because again, they are not really set up for remote care. So there are several things you really need to consider so you can make an educated choice before buying. Will someone give you a professional and in-depth hearing test? How will you understand what are the best hearing aids for you? Will someone make a recommendation on the best hearing aids for you? Will someone fit them for you? How much will the hearing test and fitting cost? How much will it cost for repairs to be handled? Finally and the big one, will the extra costs of getting someone local to help you mean a net saving or loss for you? Listen, we aren't telling you that buying hearing aids online isn't a good deal and we most definitely aren't telling you not to do it. What we are telling you is that you need to carefully consider everything we have discussed here before you make a choice. Once you have done that, our job is done. I really would urge you to discuss it with a hearing health professional before you do it. Discuss it with them and if they are willing to help you, get their agreement to help you, outlining what that help will be. You need to know that someone will actually take care of you. Because you will need it. Just a last minute addition here, it struck me that the question I should answer is "Would I be happy to sell you hearing aids online?" That is the real test isn't it? So I should answer it, I would be happy to sell you a hearing aid online if, and it's a big if, the hearing aid manufacturers made the technology available that allowed me to do an in-depth hearing test. Allowed me to do a full fitting and verification of the hearing aids and finally and probably most importantly. That I was confident that you were able and tech savvy. Right now, those conditions don't exist, so No, I wouldn't sell you a hearing aid from one of the big manufacturers online right now. We have previously written an article on the things you need to know if you are interested in buying hearing aids.